Invoice factoring is a type of accounts receivable financing that converts outstanding invoices due within 90 days into immediate cash for your business to utilize right away. Research factoring experience — Factoring firms come in all different shapes and sizes, so it’s best to narrow it down to the most experienced team. Make sure you’re talking to the firm about their experience so you know exactly what you’re getting your organization into. For example, if you oversee a small business, it’s important to make sure that the factoring company you’re working with has experience with small businesses. Discuss flexibility — The next thing you should consider is the amount of flexibility the accounts receivable firm can offer. It’s best to ask exactly how the invoice factoring company handles its business so you can take better care of your financial needs. Find out if there is a specific length of time that is required for the factoring relationship, ask if you need to sign personal guarantees, find out if you need to sell all of your invoices, and ask any additional question pertaining to the firm’s flexibility. Find out the upfront amount offered — The upfront amount the accounts receivable company offers is the percentage of the invoice cash value. 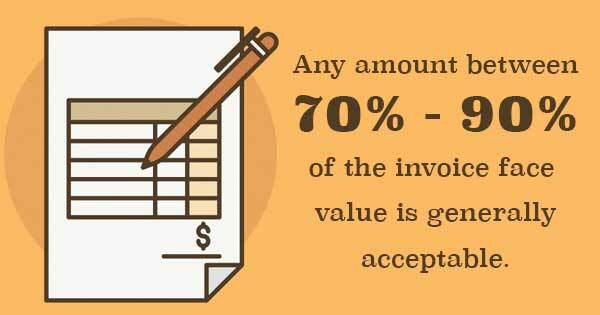 Any amount between 70% and 90% of the invoice face value is generally acceptable. But make sure you’re discussing the upfront amount, as well as all the other financial aspects with prospective invoice factoring companies. Avoid bad contracts — When figuring out how to choose the right factoring company, make sure there aren’t all sorts of hidden fees and contracts involved. Some factoring companies essentially trap their clients with long-term contracts. Be sure that you completely understand what you are signing up for. If you’re still wondering how to choose the right factoring company or if you want to learn more about accounts receivable financing rates, small business loans, or additional invoice factoring services, give Eagle Business Credit a call right away.